Have you ever had your palm read? I once had a Chinese manicurist in Brooklyn break my whole 'ish down as she trimmed, filed and painted my nails. A lot more than I had bargained for at the nail salon. Her reading was quite accurate which sparked my curiosity in the technique. Apparently, the map of our brains and our lives are in our palms. The same lines that we are born with lengthen, deepen, and broaden as our lives progress which refutes the theory that these lines are the result of usage...even fetuses have lines in their palms prior to birth. Life, health, love, prosperity and fate lines in our palm are but a window to where we are. But we ultimately determine where we are going. The ease or difficulty of our journey is dependent on the cultivation of our inner light and the alignment of that Light with the Divine. 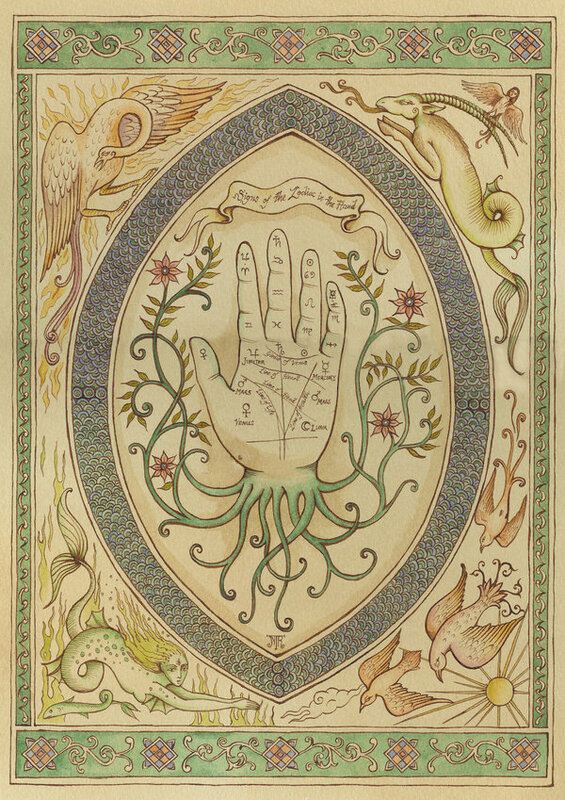 To learn more about the information in your hands, I suggest you read this: Palmistry Basics. And even if you dont take up palm reading: every scar, every beauty mark, every wrinkle, every cut, every burn tells a story. So, look at your hands and dont be afraid to look at another's analytically, compassionately and lovingly. There is nothing more beautiful and intimate than consciously holding a beloved's hand. Now, lets get to the meditation that will help give us insights into our hands and alter our outer and inner world. Sit in Easy Pose with the spine straight with chin in and chest out (Jalandhar Bandh). Rub your hands together and bring them to Prayer Pose with your thumbs against your sternum and your shoulders rolled back and down. Your eyes rolled in and up towards your third-eye brow point. Inhale through the nose and chant ONG NA MO GURU DEV NAMO (I bow to the Divine Teacher within) on two breaths. Palms are facing flat and facing the body slightly under your heart center and about a foot away from your chest. Cross your hands at the wrists with the left palm closest to the body. The thumbs of both hands will meet in the center, directly in line with each other one on top of the other. 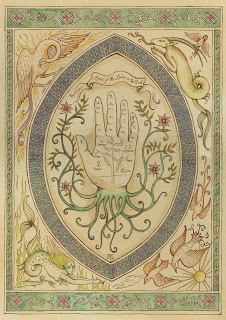 Look down into the palms and read the lines of the hand with long slow breath for 11min. You can cut this down to 3 minutes if need be. Begin to chant for 20 minutes. This can be cut down to 11 minutes if need be. Translation: Means "breath of the guru." It is the transformative wisdom that is embedded in the patterns of breath, especially those patterns generated in the expression of naad, in sound or mantra. Inhale deeply and stiffen the spine tightly. Hold for 20 seconds. Exhale. Inhale, make every muscle from head to tailbone like steel. Hold for 25 seconds. Exhale. Inhale, make your spine like a steel rod and hold the breath for 30 seconds. Exhale. If you cannot hold the breath for the prescribed amount of time, dont worry! Your lung capacity will increase over the 40 day period.